Life may exist elsewhere in the Milky Way galaxy, though try as they might, scientists have yet to detect any sign of it. Part of the problem has to do with the size of space; finding traces of organic substances or the waste signatures of alien megastructures isn’t easy at such cosmic distances. Fortunately, there’s the possibility that alien life will come to us in the form of interstellar objects. By examining interstellar asteroids and comets up close, argues Harvard astronomer Avi Loeb, we might be able to tell whether life exists elsewhere in the Milky Way galaxy – and we could do so without having to leave the cosy confines of our Solar System. Such is Loeb’s astrobiological dream experiment, which he recently described to Gizmodo. A major benefit of such a mission is that, assuming we find traces of life on an exotic object, we’d have tangible, empirical proof of alien life. This proof of life could come in three forms: microbial or animal life capable of surviving the harsh conditions of space (and possibly even re-entry through a planet’s atmosphere, spreading life elsewhere); the dead remnants of alien life (seen as chemical or biosignatures); or so-called techno-signatures, that is, the technological artefacts left by aliens. My dream project is to organise a space mission that will land on the surface of trapped interstellar objects within the Solar System and check whether they have signs of life in their interiors. One could also wait for one-time passing objects like `Oumuamua and chase them even though they are unbound to the Sun. This might require some drilling through their outer rocky ice surface. Or, instead of landing on the surface, one can study the composition of the cometary tail (if it exists) behind the object and verify by measuring its oxygen isotope ratio whether its origin is different than the rest of the material in the Solar System. Also with spectroscopy, one can search for organic molecules or biomarkers. It is commonly thought that such a search should be conducted using a large telescope aiming to detect biosignatures – molecular products of primitive life in planetary atmospheres, such as molecular oxygen combined with methane – or techno-signatures – artifacts on a planetary surface, such as megastructures or photovoltaic cells – in distant habitable planets, or alternatively by launching a spacecraft that will visit such worlds. The latter approach would take tens of thousands of years using conventional chemical rockets even for the nearest habitable planet, Proxima b. Fortunately, there is a promising alternative that will save this lengthy travel time. Instead of our spacecraft traveling to another star, we can search for objects that were ejected from other planetary systems and spent the lengthy travel time by now on their journey towards us. Even if they were to originate from the nearest star system, Alpha Centauri, these rocks should have started their trip around the time when Homo sapiens came to the scene on Earth about three hundred thousand years ago. Until recently, the prospect of exploring an interstellar object would’ve seemed absurd. But things changed on October 19, 2017 when astronomers at the Hawaiian Pan-STARRS1 telescope system detected the first known interstellar object to visit our Solar System. 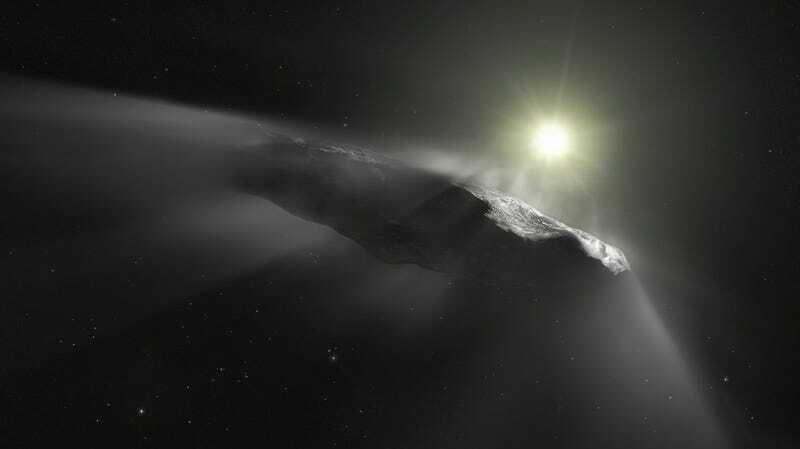 Dubbed ‘Oumuamua, meaning “messenger from afar arriving first” in the indigenous Hawaiian language, the comet-like object blazed through our Solar System at 67,100 miles per hour, while (thankfully) coming no closer to Earth than 20.5 million miles. 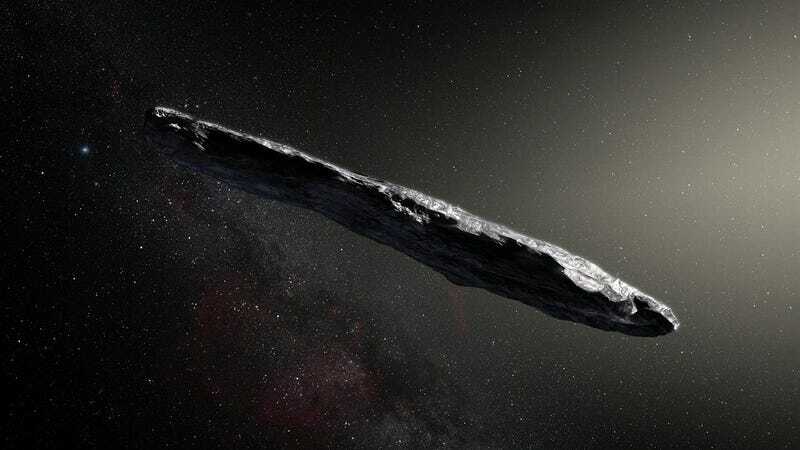 The cigar-shaped comet or asteroid (astronomers still aren’t entirely sure) didn’t stay for long, departing our Solar System to continue along its epic interstellar journey. Together with my postdoc, Manasvi Lingam, we calculated that currently there should be thousands of interstellar objects of this type that were captured within the Solar System by their interaction with Jupiter and the Sun. The Jupiter-Sun system acts as a fishing net, which traps such objects as they pass near Jupiter and lose energy through their gravitational interaction with it. A few months after our paper, an asteroid occupying an orbit indicative of this origin, BZ509, was identified in a retrograde orbit around Jupiter. Prior to ‘Oumuamua’s visit, astronomers could only theorise about the existence of visiting interstellar objects. This messenger from afar arriving first provided actual proof that it can happen – an event that has revitalized the panspermia hypothesis. This is the speculative idea that life on Earth did not emerge spontaneously as per conventional theory, but was instead delivered by incoming asteroids and comets. Let’s say, as a hypothetical, that Mars was once habitable and home to simple microorganisms. A collision with a massive asteroid could have ripped chunks of rock from the Martian surface, sending the rocks – and their biological cargo – toward Earth. After landing, these microbes would “infect” our planet with their DNA, and begin life anew in, literally, an alien environment. 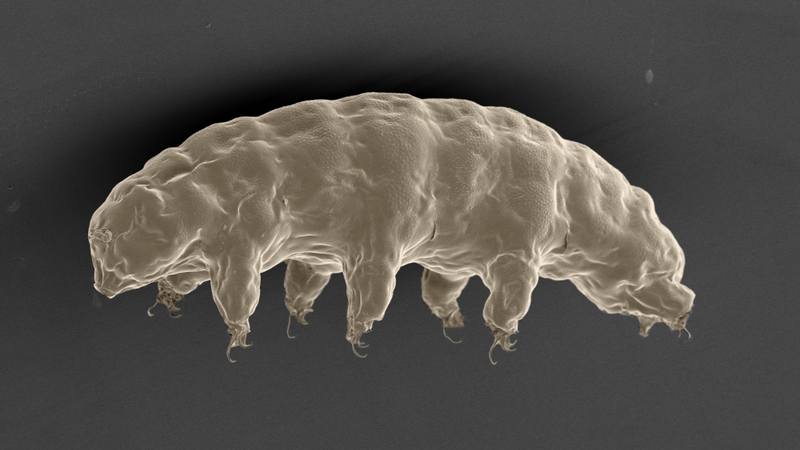 These microorganisms would have to survive extreme temperatures and the vacuum of space, but it might be possible; Earth bacteria can survive in space for prolonged periods, as can tiny tardigrade animals. Incredibly, microorganisms have also been shown capable of surviving re-entry through Earth’s atmosphere, as witnessed by bacteria that survived the Space Shuttle Columbia crash in 2003. These lifeforms would be in a severely dehydrated state, and, at least in theory, could be re-animated once introduced to the right conditions. It’s not clear whether life would survive the journey under freezing temperatures and bombardment by cosmic rays. And also whether most asteroids kicked out of a planetary system would have any life on them to start with. This is probably not the case in the Solar System, since most asteroids or comets show no sign of life on them. But even if dead microorganisms were discovered, or just their chemical traces, it would still represent direct evidence for the existence of life beyond our Solar System. These biosignatures could include accumulated piles of microbes (called stromatolites), traces of waste (yep, alien poo), organic compounds containing carbon, nitrogen, and hydrogen, or traces of fat and steroids. Even skeletal fossils could conceivably exist within the rock. The implications of such a discovery would be huge, to say the least. Finding life on an object of interstellar origin, Loeb argues, would not only demonstrate that life exists elsewhere, but also that it can be transferred between planetary systems – an important next step in validating the panspermia hypothesis. Most interestingly, one of the interstellar object might show up as a technological device and not just a rock. Physicist Enrico Fermi asked: “Where is everybody?” suggesting that advanced extra-solar civilizations may not exist because we do not detect obvious signals from them in the sky. But one should keep in mind that the rate of growth in technological knowledge is often proportional to past knowledge. Hence the growth of advanced technologies tends to be exponential. The technological advances may saturate due to the destructive impact of technology, resulting in climate change or nuclear and biological wars. The answer to Fermi’s paradox may be that advanced civilizations are short lived. In this case, we would find relics of dead civilizations, many graveyards on the surfaces of habitable planets but some techno-signatures in the form of strange objects passing through our Solar System, potentially carrying innovative technologies that we have not mastered yet. Loeb’s dream experiment may be a long shot, but in many ways, it’s quite feasible. We’re actually getting really good at detecting biosignatures and biomarkers within Earth’s oldest rocks, and similar approaches could be used when exploring nearby asteroids and comets. At the same time, next-gen telescopes could be used to sniff out potential biosignatures from afar, as Loeb points out. And while landing on an asteroid or comet is extremely difficult, scientists are working on it. A mission to an interstellar object would be somewhat similar to the current Japan Hayabusa2 mission, which is scheduled to retrieve surface samples from the Ryugu asteroid and return them to Earth for analysis. It’s a dream experiment, to be sure, but one grounded in real science.